This work trip started out as many of them do – very inconveniently! I had booked a week in the US over the 4th of July, and of course then found out I had to be in Italy for work the following Monday – boo hoo, I know – I really can’t complain about getting to see my family and then having to travel straight away to one of Europe’s most beautiful countries. But the journey was LONG. I took a red eye from Boston to Amsterdam, went to my apartment, dropped off my big suitcase from my US trip, picked up some hand luggage I had pre packed for Italy, took a DEEP breath and turned right back around and went to the airport, hopped on a plane to Italy, took a cab into town, and then had to shift right into work mode. This is probably the longest stretch I’ve ever been awake, but more on that later. Below is sleepy, literal red-eye Ali on her way from the US to Amsterdam. Of course, the second I arrived in bright, sunny Italy, the sleepiness melted away and I immediately kicked into productive work mode! 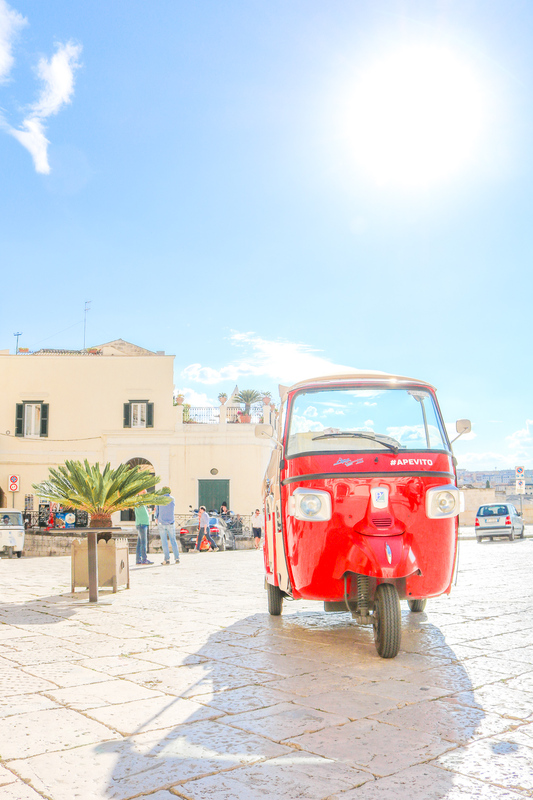 We were shooting in two locations in Southern Italy – Matera and Alberobello. They’re about and hour apart, and I think we drove back and fourth at lest ten times that week! 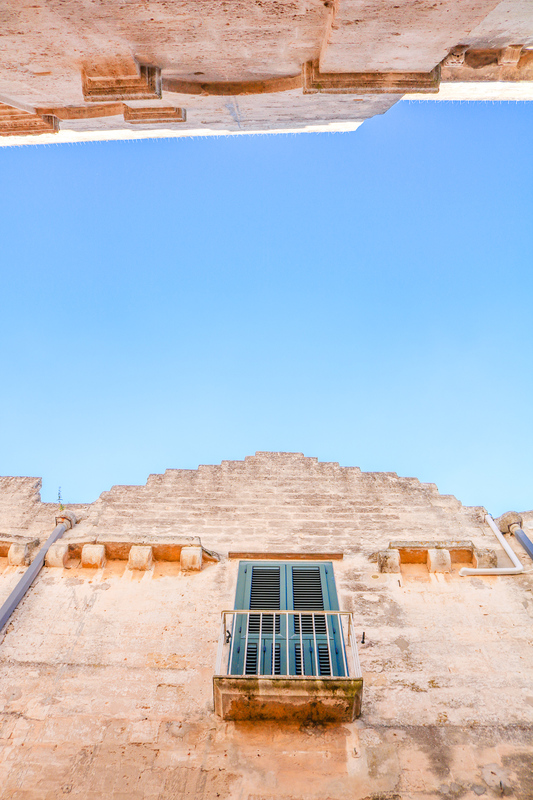 In this post I’ll take you through our time in Matera, and then stay tuned for some shots of Alberobello in my next post! 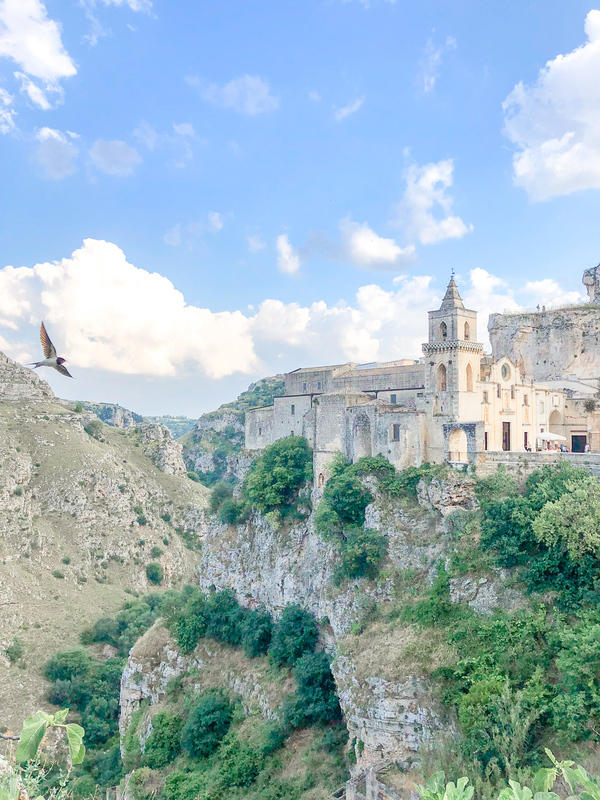 Matera is a stunning stone city, carved into the side of a small canyon. The canyon was settled thousands of years ago, and was home to the first human settlements in Italy. While the canon and its caves were inhabited as early as 7000 BC, the city was officially founded by the Romans in the 3rd century BC. 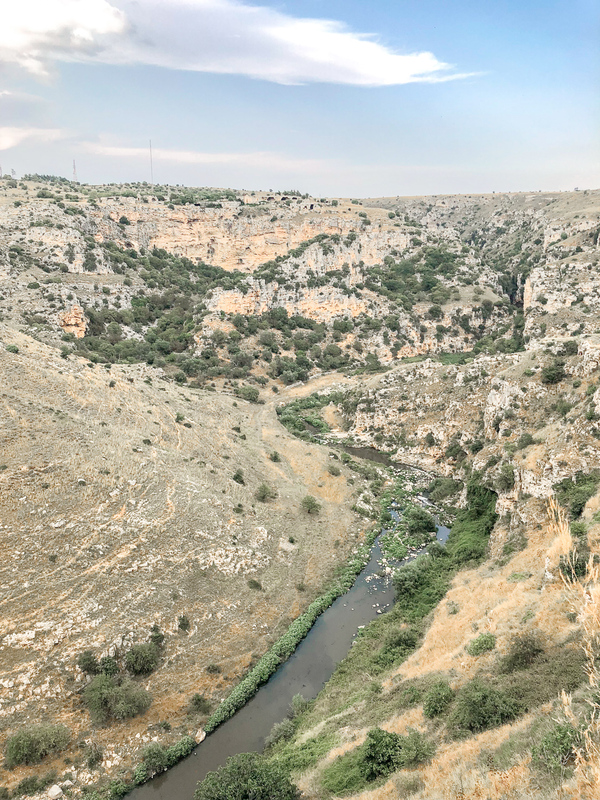 Today, it’s home to a swelling population of Italians, who utilize the caves as homes, hotels, restaurants, and shops, with large stone buildings sprawling from the cliff’s edge. Matera has a breathtaking cityscape. 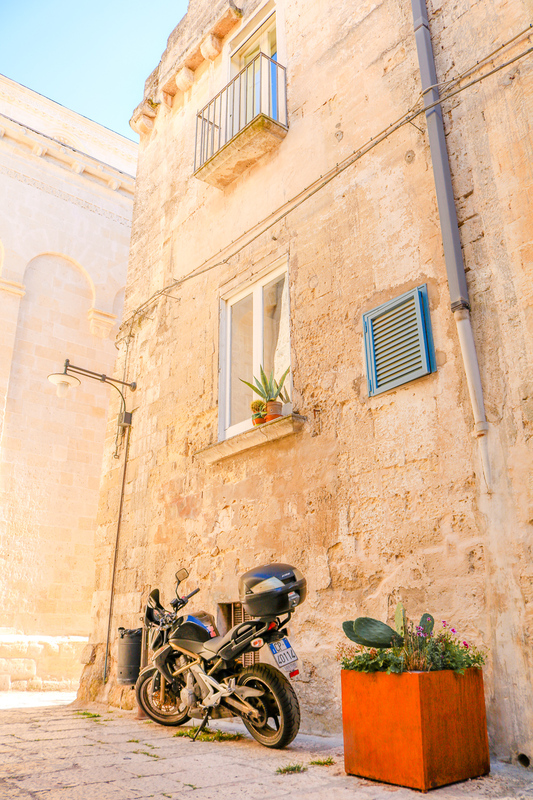 To get to Italy, I flew into Bari, and expected the majority of our shoot to take place in and around Bari on the coast. I was so delighted to find out that my home for the week would be this magical stone city. When I’m in the US, I tend to eat a lot more (hello huge American portion sizes!) and be less active (driving instead of biking and walking is the main culprit!) so after my two week jaunt to the US, I arrived back in Europe feeling slightly lethargic and not my best me! I vowed to eat healthy in Italy, but was offered a gelato by our producer ten minutes into the trip, and said yes without batting an eye. Life is too short to say ‘no’ to the gelato! 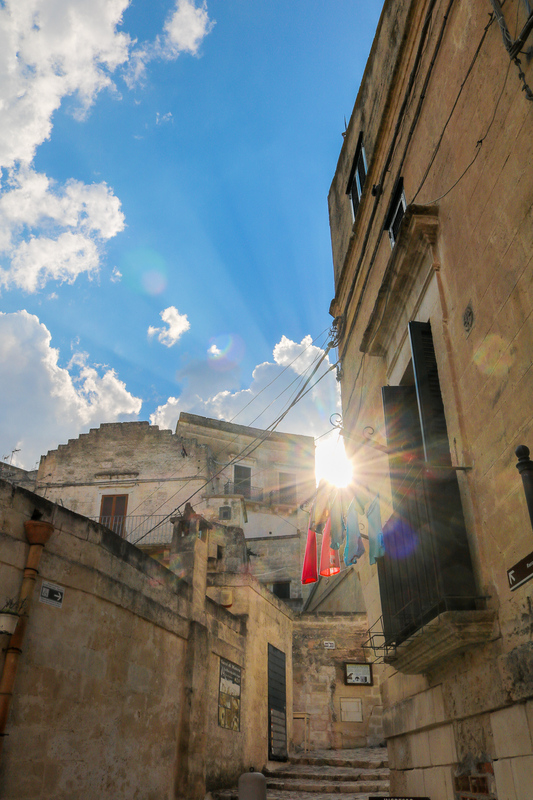 Why do I have so many gorgeous photos of Matera from a work trip? My task on this business trip was to scout out potential locations we could shoot at, so I spent the week visiting hotels, rooftop restaurants, spas, and dreamy terraces where we could potentially film. While I was on holiday in the US, my team members started filming in Albania, and were making their way down through Croatia, eventually to Italy, with the family we were shooting. My job was to travel ahead and help figure out where we would shoot for the Italy portion of the trip. This would allow us to film in Italy consecutively, without having to pause for days in between to prep and logistics. You will see in the film at the end, that we were working with a family who had never traveled before, filming their first vacation together as a family. It was such a magical project to be a part of, and the fact that we were in my favorite European country made it even more special! So that’s a long winded way of saying that I spent a lot of time checking out beautiful buildings and panoramas – a prime opportunity for photo taking! A lot of these shots are actually i-Phone photos! The director we were traveling with forgot a wide lens, and asked to use mine for our scouting days. Thankfully I had my DSLR in tow and was happy to lend my lens :) Below is the terrace that became our home base. It overlooked the canyon and had just enough shade to see a laptop screen! By the end of day one, I was EXHAUSTED. We didn’t finish our scouting until 10pm, as we had to test the light in various locations, and the sun didn’t set until late. The team I was with then suggested grabbing a bite to eat. Every minute my eyes were open was pure pain – at this point I was pushing two days on no sleep! I fought to stay awake in the production van on the drive back to our hotel in Alberobello. By the time we arrived, I was delirious. 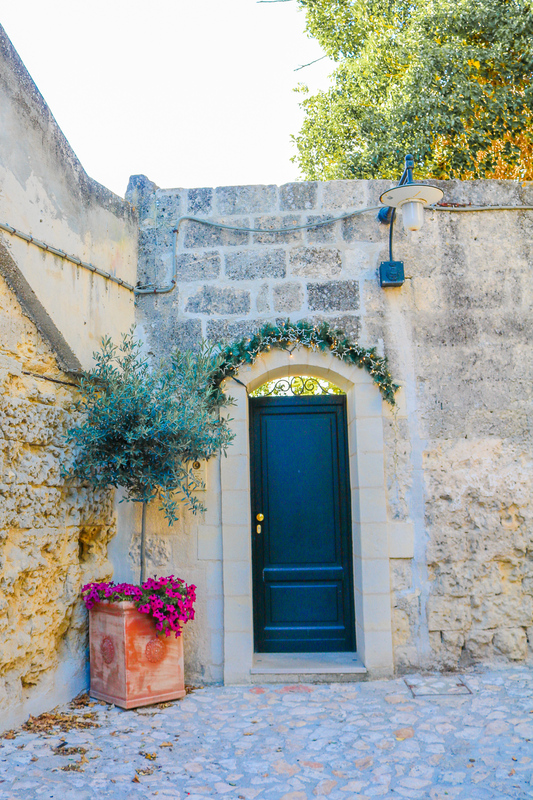 Our hotel consisted of dozens of small trulli (if you don’t know what a trullo is, just wait until my next post!) and although I was excited to stay in an adorable Italian stone house, I was the most excited for BED! I hauled my suitcase from the back of the van, carried it up the stone stairs to my room, got the key in the door, and stepped into the dark space, only to be surprised by a small step down just beyond the door. I crashed to the floor with my suitcase and heard a loud pop as my ankle snapped in a painful direction. The next four hours were a blur, but I wound up in an Italian hospital getting x-rays at 1am. Thankfully my ankle was very sprained but not broken. By the time I got back from the hospital, I had not sleep for more than 55 hours straight. I told the team I would be joining slightly later the next day (my 7am call time was not happening!) and they were incredibly thoughtful and arranged for a tuktuk to pick me up from my hotel room! Stay tuned for tuktuk photos in the next post ;) But I can’t complain – waking up to this view, sore ankle or not, was unforgettable! I spent the day hobbling around, scouting out hotels and spas for our film. This hotel is the Palazzo Viceconte, where the family we were filming wound up staying. Walking through the halls of this hotel was like exploring an Italian fine art museum. If I ever come back to Matera, this is where I will call home! After a full morning of scouting, we stopped for a quick lunch at Le Bubbole, which was by far the best meal of the trip. We came back here two more times because the food was so good and we wanted the rest of the team to experience it as well! We spent quite a bit of time in the country side as well – this lush spa was in the middle of no where, but would be well worth the trek if you’re looking for some peace, quiet, rest and relaxation. And they provide such stylish footwear for you to wear! ;) While I was mainly based in Arabello, we did spend two nights in Matera at the very end of our production. I stayed at the Palazzo Del Duca which had crisp white sheets, high brick vaulted ceilings, and a stunning chandelier! Towards the end of the week, the rest of the Booking.com team also finally arrived in Matera! We worked around the clock (when you’re creating a documentary style film it never stops!) but we did pause occasionally for meals – which were always unbelievably good! 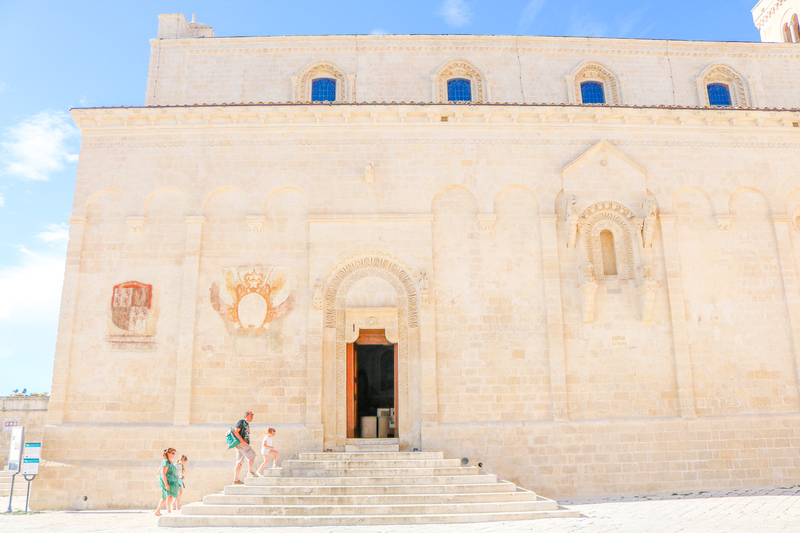 In addition to the food, the colors of Matera also really blew my mind! I know I’ve shared a lot of lush food images from this trip, but the below photo is a more accurate depiction of what our crew meals looked like – although still beautiful as heck if you ask me! On the last day of our production, we had to shoot the climax of our film which involved throwing a wedding! Well, technically it was a vow renewal, but we went through all of the wedding motions – selecting flowers, a celebrant, attire, music, hair and makeup, writing vows, and arranging a fun reception to follow! It was by far one of the most emotional scenes we’ve ever filmed. And I love that all of the Booking ladies packed cocktail attire to wear to the wedding! As the sun set, we filmed the final shots for our content. It was such a romantic evening, and I am so thankful that I got to work to make a family’s dreams come true! Here’s shot of the team after we wrapped – what a fantastic bunch to work with! Now check out the film! I bet you will notice a lot of the spots from my photos coming to life before your eyes! Beautiful Arabello to come next! Beautifully done Ali! Your team really captured the emotional essence of this family, bravo! Loved this post and beautifully done video! Oh my… I cried like a baby during that video. Very touching indeed and very effective! Well done.